A bronze bottle, the compressed spherical body supported on a splayed foot, which has a rolled edge. The long, slender neck rises from a single ridge at the shoulder and terminates in a flared mouth. The metal has a brownish patina with significant areas of ruby-red and light green encrustation. The unadorned simplicity of this bottle leads us to believe that it was made for use in a temple. 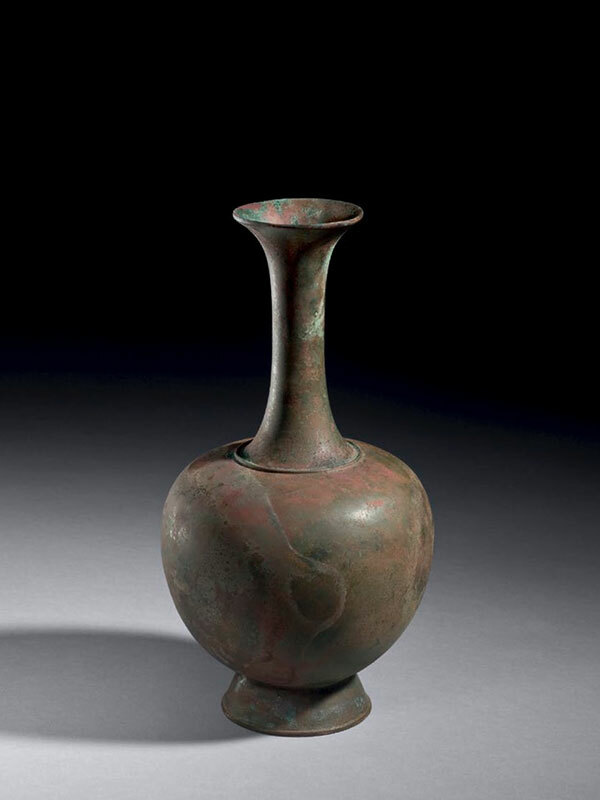 The ovoid body and slender neck of the metal bottle are seemingly separated and emphasised by a ridge line; this feature, as well as the ring-foot and the expanding mouth were reproduced faithfully in glazed stoneware. Two closely comparable bronze bottles of similar size and shape, both dated to the Tang dynasty, are respectively in the collections of the Tokyo National Museum and the Nara National Museum. A comparable stoneware bottle covered in transparent glaze, of similar size and shape, is in the Hoyt collection at the Museum of Fine Arts, Boston.